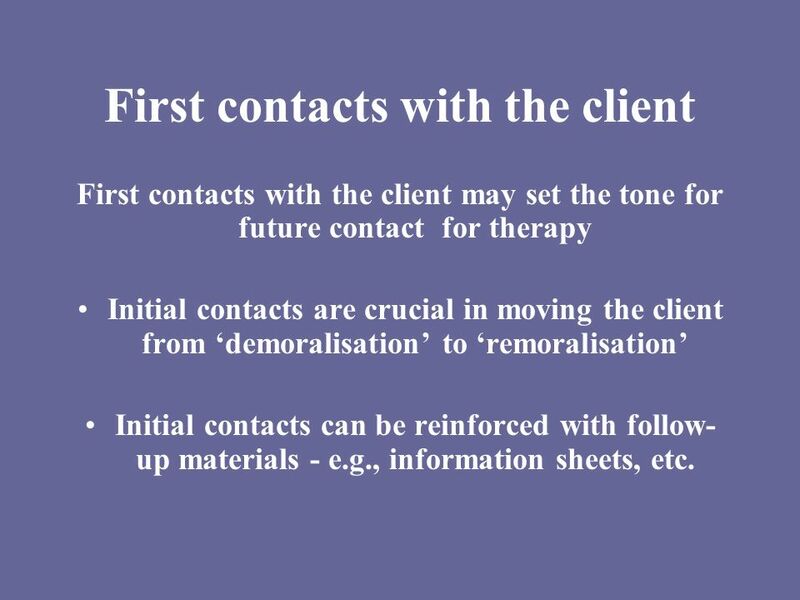 First contacts with the client may set the tone for future contact for therapy Initial contacts are crucial in moving the client from ‘demoralisation’ to ‘remoralisation’ Initial contacts can be reinforced with follow-up materials - e.g., information sheets, etc. Does the client seem more or less hopeful now? Is there collaboration? Are clear and realistic goals emerging? What is the balance of work and responsibility between therapist and client? What is the current problem? What keeps the problem going? How did the problem develop? What are the roots of the problem? What other factors such as health of client could be involved? 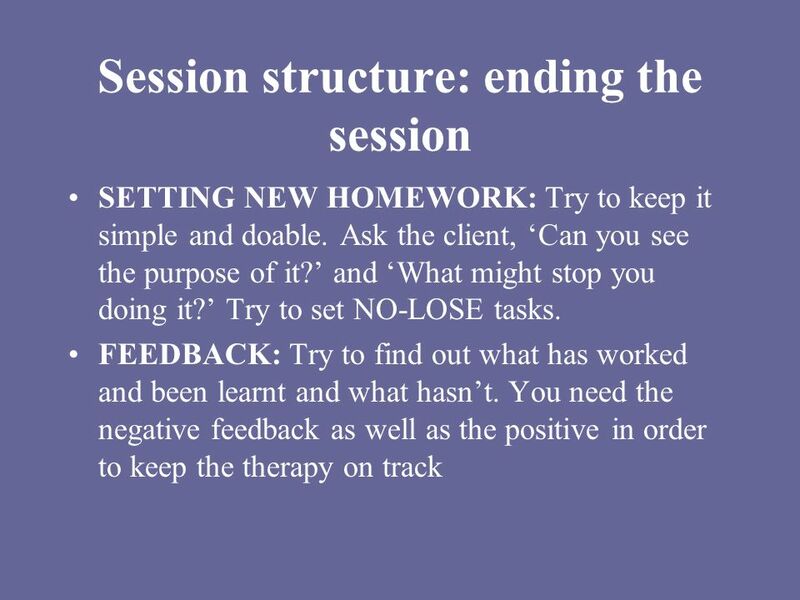 What are the client’s expectations of and goals for therapy? 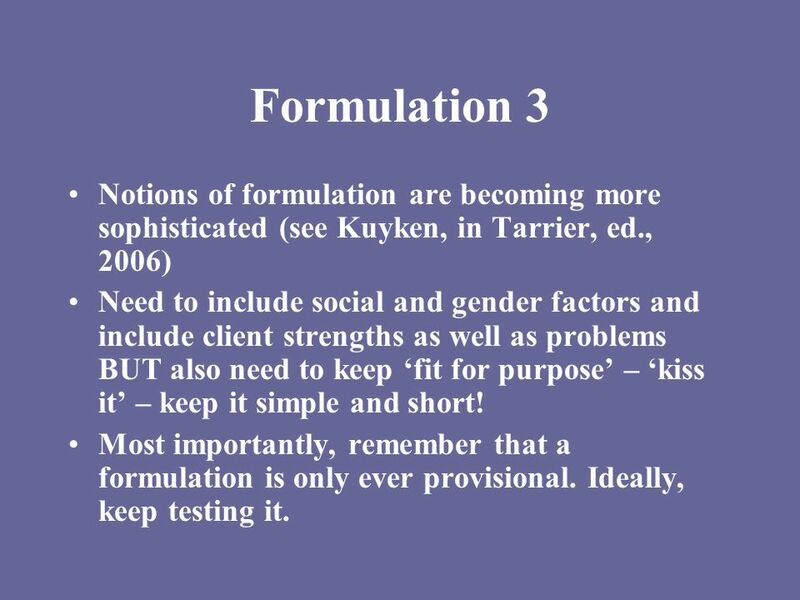 9 Formulation 3 Notions of formulation are becoming more sophisticated (see Kuyken, in Tarrier, ed., 2006) Need to include social and gender factors and include client strengths as well as problems BUT also need to keep ‘fit for purpose’ – ‘kiss it’ – keep it simple and short! 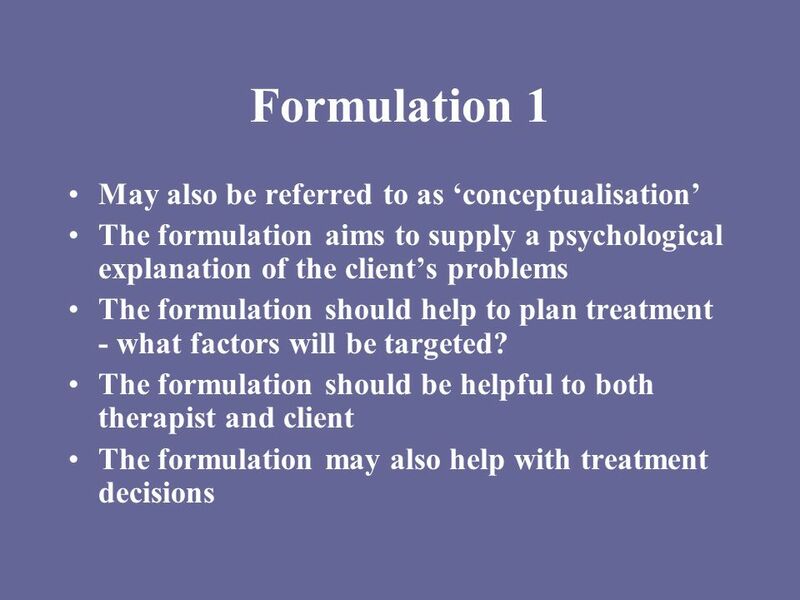 Most importantly, remember that a formulation is only ever provisional. Ideally, keep testing it. 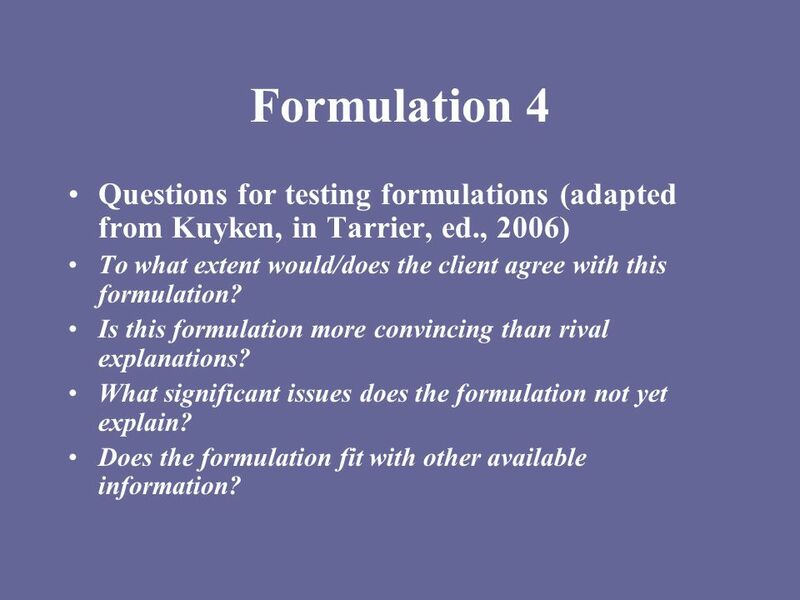 10 Formulation 4 Questions for testing formulations (adapted from Kuyken, in Tarrier, ed., 2006) To what extent would/does the client agree with this formulation? Is this formulation more convincing than rival explanations? What significant issues does the formulation not yet explain? 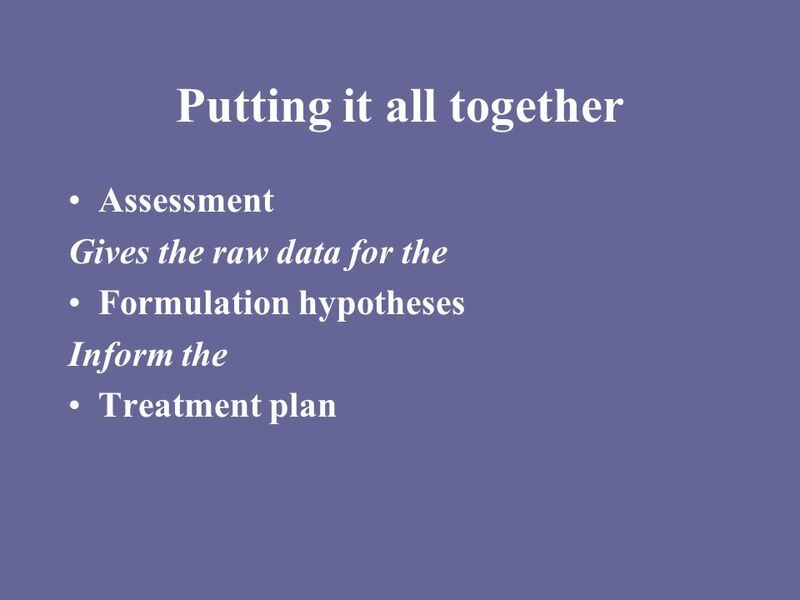 Does the formulation fit with other available information? 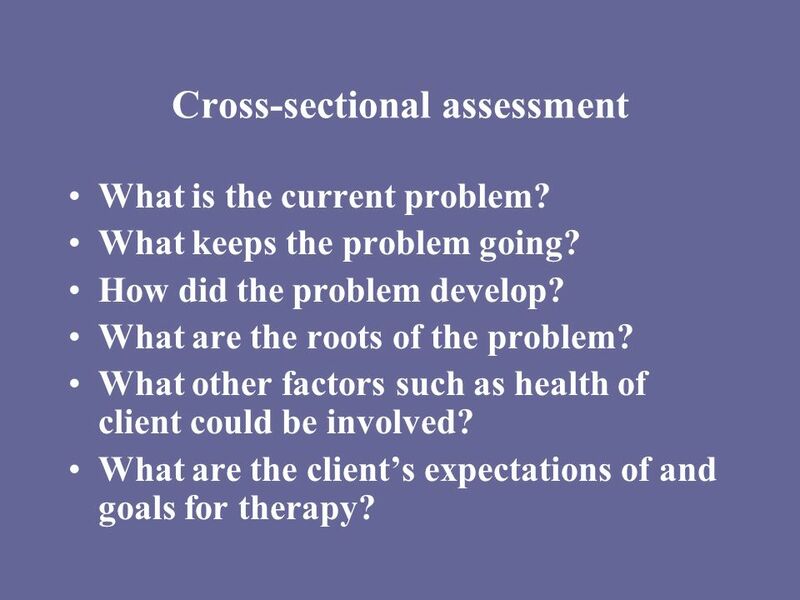 ON THE ONE HAND – Being comfortable with the structure seems to be one of the distinguishing features of CB therapists or, conversely, discomfort with it may be a distinguishing feature of those who don’t like it or can’t do it (Wills, in Sills, ed., 2006). 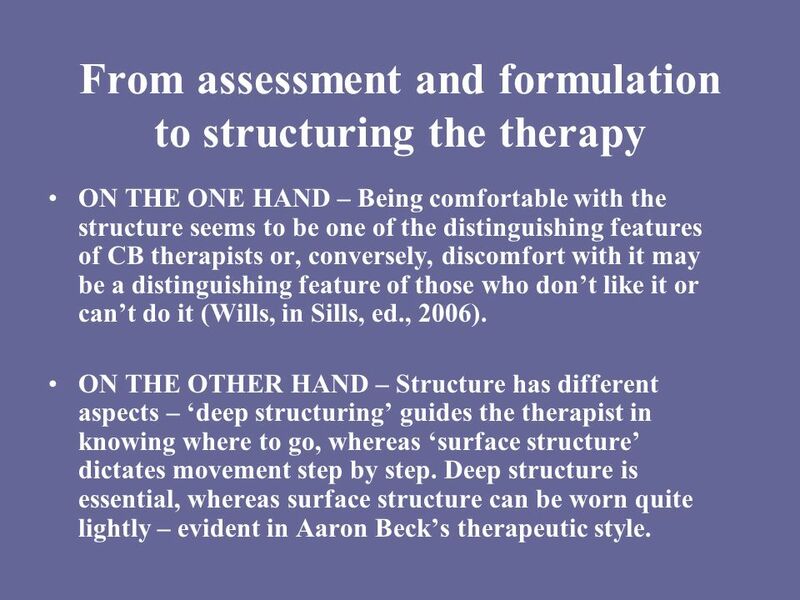 ON THE OTHER HAND – Structure has different aspects – ‘deep structuring’ guides the therapist in knowing where to go, whereas ‘surface structure’ dictates movement step by step. Deep structure is essential, whereas surface structure can be worn quite lightly – evident in Aaron Beck’s therapeutic style. 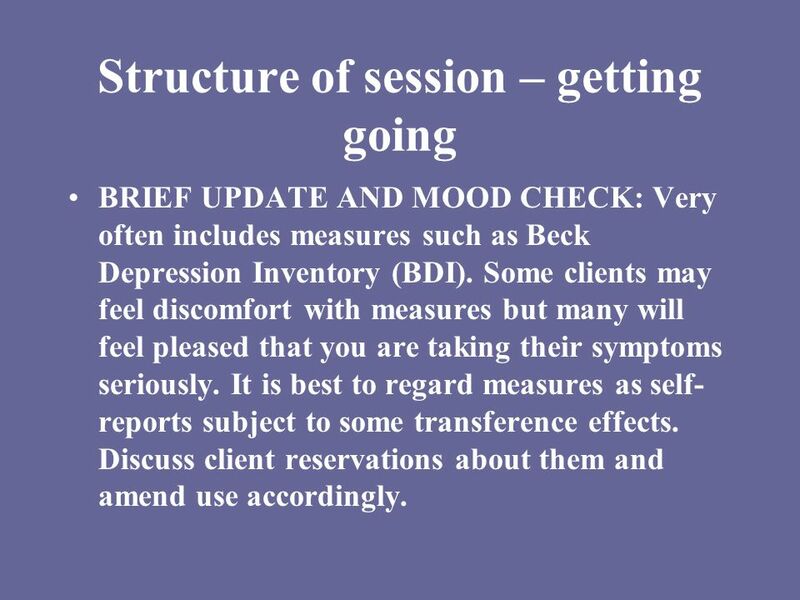 BRIEF UPDATE AND MOOD CHECK: Very often includes measures such as Beck Depression Inventory (BDI). Some clients may feel discomfort with measures but many will feel pleased that you are taking their symptoms seriously. It is best to regard measures as self-reports subject to some transference effects. Discuss client reservations about them and amend use accordingly. 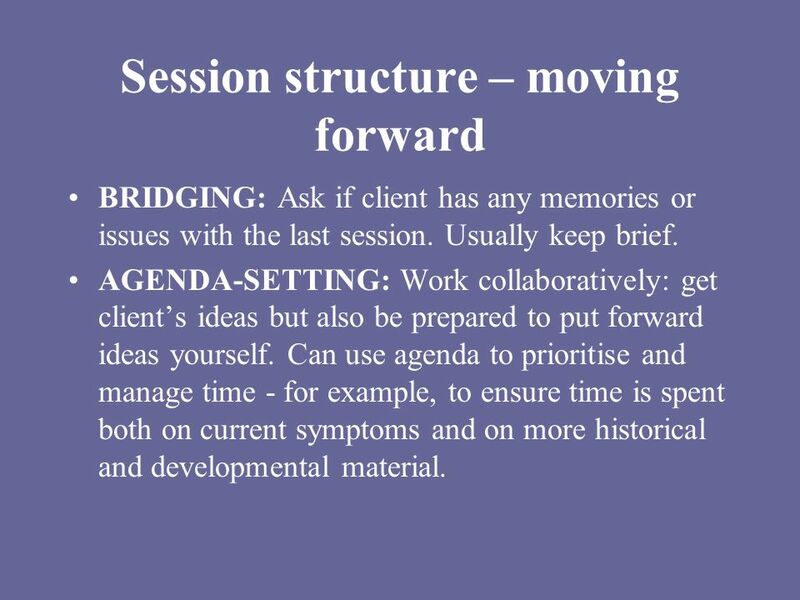 BRIDGING: Ask if client has any memories or issues with the last session. Usually keep brief. AGENDA-SETTING: Work collaboratively: get client’s ideas but also be prepared to put forward ideas yourself. 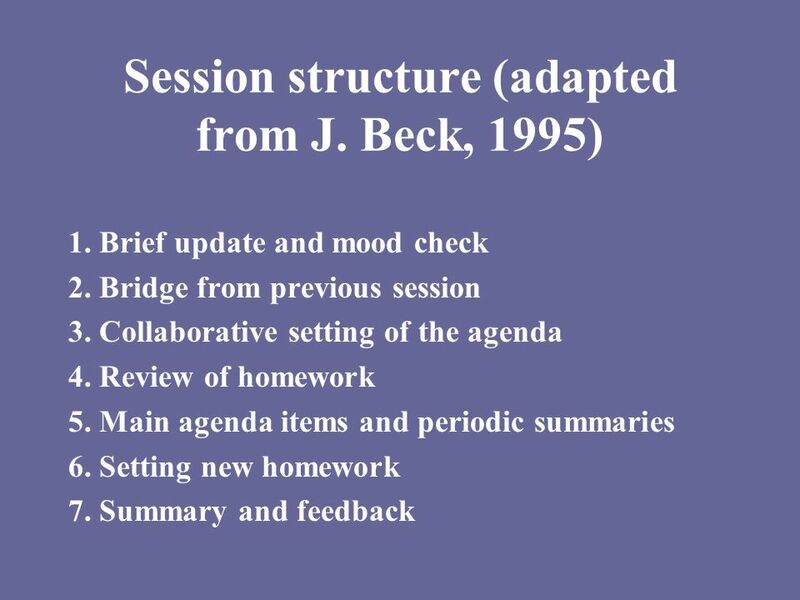 Can use agenda to prioritise and manage time - for example, to ensure time is spent both on current symptoms and on more historical and developmental material. REVIEW OF HOMEWORK: Don’t forget to do this, as forgetting may reduce client’s motivation to do further tasks. May be helpful for client to keep homework in a ‘therapy notebook’. MAIN AGENDA ITEMS: Some trainees feel like they are being ‘directive’ by encouraging clients to stick to an agenda of items. This may occasionally be true but check out with clients. Padesky & Mooney (1998) suggest that there may be subtle ‘therapist beliefs’ – ‘If I structure the session, the client will experience me as a bully’, etc.! 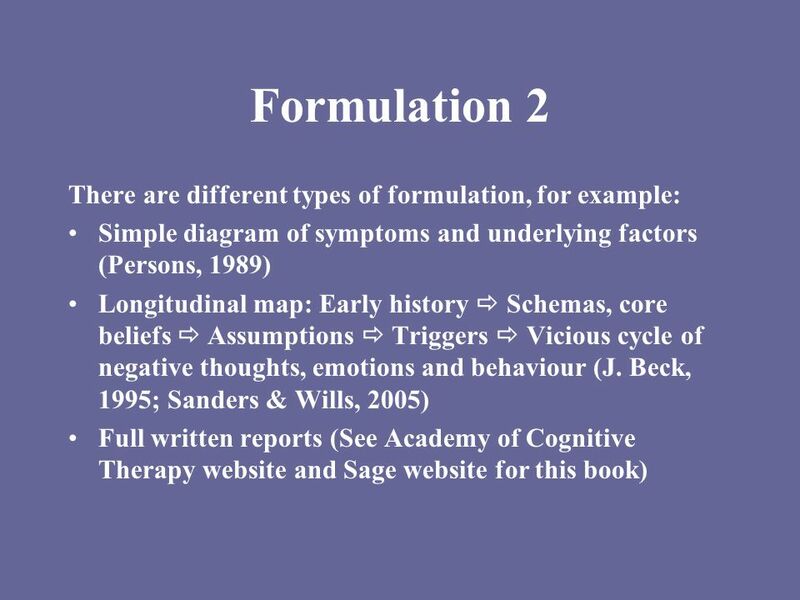 Download ppt "Skills in Cognitive Behaviour"
Skills in Cognitive Behaviour Counselling & Psychotherapy FRANK WILLS (2008) London: SAGE CHAPTER 5 SKILLS FOR WORKING ON CHANGING BEHAVIOUR. Counselling Skills: Consolidating Practice Day 2. Here is how close you are to the knowledge or skills you are trying to develop, and heres what you need to do next. 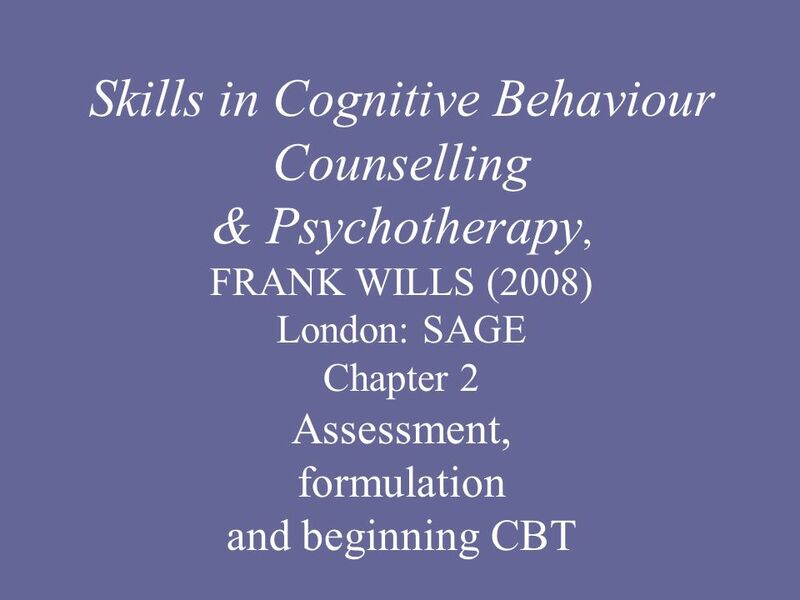 Skills in Cognitive Behaviour Counselling & Psychotherapy FRANK WILLS (2008) London: SAGE Chapter 3 Using interpersonal skills in CBT. Developing our next strategic plan Manager’s pack TEAM MEETING DISCUSSIONS. Boost Your Mood Week 6 Let’s Talk Course. Week 6 Review of what we learnt over the course Action Plans and potential difficulties Possible setbacks and. PSYC D Interviewing Skills 1. PSYC D Interviewing Skills 2 Format of Role Play 30 to 40 minute interview 30 to 40 minute interview Interviewer. WEST EDINBURGH SUPPORT TEAM 27 th OCTOBER 2005 Malcolm Laing. SOWK6190/SOWK6127 Cognitive Behavioural Therapy and Cognitive Behavioural Intervention Week 6 - Responding to automatic thoughts and modifying intermediate. Cognitive Behavioural Therapy CBT Based on Pages of the Course Companion. 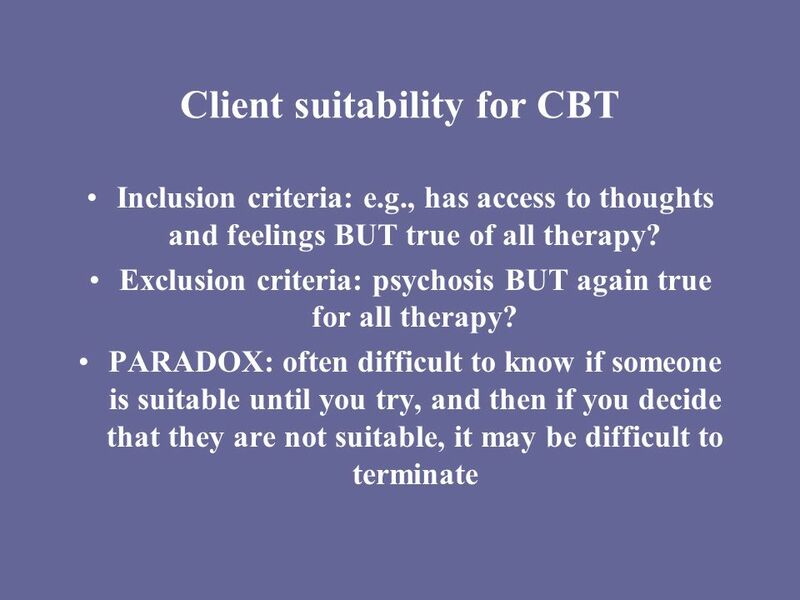 Cognitive behavioral therapy (CBT) By Mr Daniel Hansson. Initiating the session. Learning outcomes To understand the core objectives of initiating the consultation To understand the core objectives of initiating.